Right now, everyone is looking for Technicians. The average shop could use at least two more Technicians. This same shop typically has a Technician with plans to leave. If that Technician actually leaves, we now need to find three Technicians. Two Technicians was hard enough to find and now we need to find another one? We can’t afford to keep losing Technicians. What are we going to do to stop this insanity? We have to focus on retaining our Technicians. We spend so much of our time and resources trying to recruit new Technicians. We have done the worst possible thing we could do to our most valued resource. We’ve taken them for granted. How many times have you heard that a Technician left for more pay? Or do you see ads for Technicians that offer a sign-on bonus? The other day I heard a Technician ask a Manager, “If I quit, will you re-hire me so I can get a sign-on bonus?” The Manager’s response was more shocking than the question. “I’ll ask the GM if that’s ok,” he said. We have to stop ignoring this problem and address it. Now that I’ve lobbied to the emotional side of your brain let’s talk to the analytical side. It’s reasonable to say that a Master Technician could earn $10,000.00 as a sign-on bonus. If you have a shop with 8 Technicians and you pay $25 per week toward their tool bill it would cost you $10,400.00 per year. Now how many shops in town would gladly pay $10,000.00 for one of your Technicians, while it costs you $10,400.00 to keep the ones you have? Right now, more than ever, we need to have a plan to retain our Technicians. We need to figure out why they are really leaving us. Technicians are not the best communicators. They are often asked questions like “What can we do to keep you?” or “How much would we need to pay you to stay.” These are questions that Managers feel are powerful negotiating tactics. But all the Technician hears is a sales pitch. Technicians should be recognized without having to threaten to leave. By the time a Technician is in your office they probably have another job already lined up. Getting to know your Technicians is essential to retaining them. So many of us assume that because they turn a lot of hours or have a good schedule, they won’t leave us. But take it from someone who’s heard it more than once. Money and schedule are only a small part of why Technicians quit. 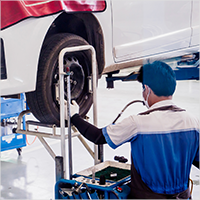 Our evaluation process offers extensive Technician interviews. Let me know if you would like me to visit your store. You’re going to be surprised when you learn what makes your Technicians tick.